Clearer insight into the impact of millennials on the demographics of the U.S.
A lot is said about millennials, but there were two things in this article by Pew Research that I don’t recall reading before. The first is that 15% of the millennial population numbers includes people not born in the U.S. 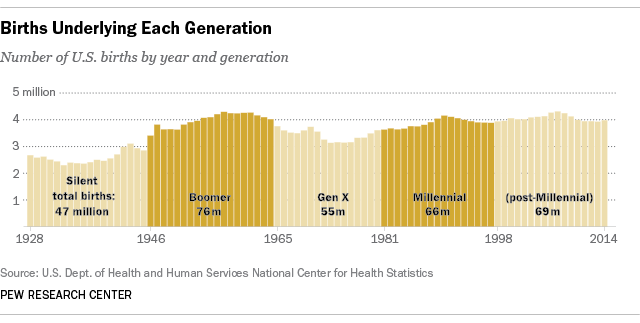 The number of millennials born in the U.S. was 10 million less than the number of U.S-born baby boomers. The second is that the group after the millennials, which Pew currently calls post-millennial, had more born in the U.S. than millennials. We’ll probably start hearing more about the post-millennial generation as soon as better name is found. The darker the colors the faster the growth. Great book mixing science, history and politics. The story goes back to understand the science (and the struggle to find the right path and understanding). It also helps you appreciate the way scientists work. It is a thick book, but very rewarding for its insights. This was a major development in science, but Rhodes downplays it’s military importance. During the way it was speculation on how far along the various countries were in developing an atomic weapon. When the war ended it was clearer that the countries were much farther behind. Rhodes also writes about that time when only Japan is still fighting and the leaders in the U.S. are trying to decide how to bring the war to a quick end. The atomic bond was terrible but so was the incendiary bombing in cities such as Dresden and Tokyo. Those bombings killed tens of thousands of people too. In the decisions of which cities might be bombed with an atomic bomb, those targets were chosen partially on cities that had not been bombed with incendiaries. Rhodes book stop with the bombing of Nagasaki, but the book discusses how the scientists were already far along on the development of the thermonuclear bomb. The development of atomic weapons shows just how terrible the rise of Hitler and Nazism was viewed across the world. It was evil that must be stopped. Good overview of some risks modern armies face against today’s technology and cyberwar. I always appreciate a book that offers readers ways to learn more about the topics. I’m more used to this genre thanks to Tom Clancy, so it’s harder to get as excited about a book following that path. But it does remind us that regardless of the technology, in the end it comes down to people, sometimes acting independently. At the end of the book, I felt unsettled, because the threats so strongly identified in the book still exist today. The story of what the Wright Brothers did in 1903 is well known, but McCullough tells more. Especially interesting was the time after their first flight. They did not build a huge corporation after their flight. Their actions show being first to market does not always guarantee success. Business is very different than solving the issues of powered flight.